My card for the CAS Mix Up Challenge! I used 3 thee stencils for this card. Watercolors, Gesso and Distress Inks. The sweet sentiment, Que sera sera, from Serendipity Stamps. The stencil with the dancing lady is from Magenta. This is gorgeous, Birgit! I love the dancer, the added stenciling and the wonderful sentiment! Thanks so much for sharing this with us at CAS Mix Up! This is so artsy and beautiful, Birgit! Love the mix of stencils and the colours that you've used. Great design! Thanks for sharing with us at CAS Mix Up! Such a beautiful flow to your gorgeous layered stenciled images, Birgit. Love your neutral colors and CAS design. 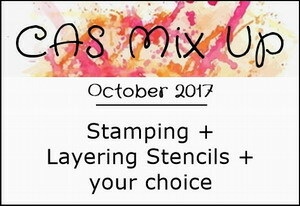 TFS and joining us at CAS Mix Up. Hugs..
Hi Birgit, I always enjoy your art and discovered just that you have used ' my' stencil that I have designed for Magenta. Great to see what you have created with it! You have an unique style!